The household with pets has unique cleaning requirements, and this is especially true for those with multiple animals. Dogs and cats shed quite a bit and their hair contains dander, an allergen that can trigger a reaction in a certain percentage of people. And if they spend any amount of time outdoors they will undoubtedly drag mud and dirt in on their paws which quickly becomes embedded deep in your carpet fibers. A vacuum cleaner that is equipped to handle this is a must or your home will become a haven for filth and almost unbearable for those family members with indoor allergies. HEPA filtration – A quality HEPA filter is the most important tool for removing allergens like dust mites, dander, and even pollen from the air inside your home. Any model designed for pets must have it and be rated to remove more than 99% of the smallest particles from the air before it is expelled from the machine. Powerful Suction – It’s equally important to get a model with enough suction to pull deeply embedded dirt particles from down into your carpeting. You will want a vacuum that is built for at least medium pile rugs but preferably high pile. Handheld Powered Attachments (For Full Sized Models) – These types of attachments are especially important if your animals spend any time on furniture or beds as you will need a way to remove the hair from these surfaces on a regular basis. Spinning brushes are necessary to loosen the hair up so it can be pulled into the hose. Bagged Vs Bagless – Typically a bagged vacuum will keep the dirt trapped inside with much less clogging than bagless but there are exceptions. Dyson is one of the brands that designs their machines to be virtually clog proof with fully sealed filtration. The bagless vacuums we recommend here fit that description. 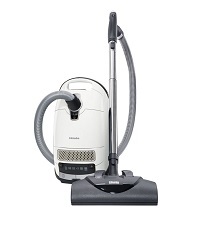 The Miele C3 Cat and Dog is our top recommended vacuum cleaner in the canister category. It gets our highest rating for removing pet hair from the carpets and other surfaces around the home in the very popular canister category. Leading the way in a very robust list of features is their Active AirClean filter, designed specifically to remove allergens and odors which drastically improves the indoor air quality of your house. The six stage variable speed motor can be adjusted on the fly via an easy to operate foot pedal to give you the suction necessary for all types of carpets. The powered floorhead also has an efficient design which maximizes suction even on the lowest setting. This is important as animal hairs can tangle within the carpet fibers, requiring a good amount of power to pull them out. Attachments are another must have for a vacuum built specifically for pets. The C3 comes with crevice and upholstery nozzles as well as a soft bristle dusting brush. 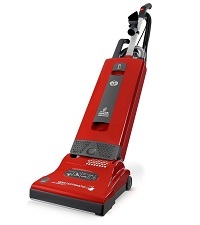 Like most modern vacuums these are integrated into the body for quick access. Click here for purchase options at our recommended online store! The only real downside is the price as it is on the higher end of residential models. Buying a machine like this is more of an investment rather than an expense as Miele designs all of their cleaners to last more than 10 years. In fact their engineers put each one through the equivalent of 20 years of typical use. What do we really like about the Miele C3 Cat and Dog? Where can you read more and check current pricing? For current pricing and to read additional consumer reviews, click here to visit our recommended supplier. 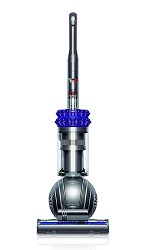 The Dyson Cinetic Big Ball Animal takes the top award in our bagless upright category!. It is a lightweight, powerful, and highly maneuverable bagless vacuum cleaner that has several features quite unlike anything the competition has. Dyson is one of the best known brands in the industry with models known for extreme suction power and long lasting construction. Their patented Root Cyclone™ technology is a unique design of the internal airflow pathways to maximize suction power. It also keeps a constant air pressure which doesn’t allow the microscopic dust particles to settle anywhere but instead be carried into the dirt chamber. You end up with a machine that does not clog during normal use. The Big Ball is larger than their traditional offerings which gives it an even lower center of gravity. This allows you to move it around furniture with little effort as compared to other large uprights. The polycarbonate ball also houses many of the Animal’s key components inside which keeps them away from anything that can damage them. You end up with a 360 degree of motion during use and even though it is large you will have no trouble using it. The suction power is so strong that there are no filters to wash or replace. A Dyson upright will usually come with a washable filter but that is not the case with the Cinetic powered Animal. 36 different cyclones push the air as fast as 180 mph which gives the tiny dirt particles zero chance of settling inside. The power stays constant throughout the entire cleaning session. The powered Turbine Tool has no brushbar, resulting in a tangle free operation. Rotating heads and brushes are all that is needed to pull hair out of stairs or upholstery. The flexible head will also move around tight spaces and maintain a constant contact across uneven surfaces. You also get a multi-angle brush which is great for stretching around corners and in awkward spaces. Click here to visit our recommended supplier for current low pricing! Other features include a self adjusting cleaning head to handle a variety of floor heights, a quick release long reaching wand that can reach up an entire flight of stairs, and other various attachments for dusting and vacuuming stairs. Another note about the self adjusting head…it actually seals the suction as it adjusts itself to fit the surface type. By doing this it doesn’t blow particles all around like some of the other (cheaper) brands do which is a big advantage with pets. 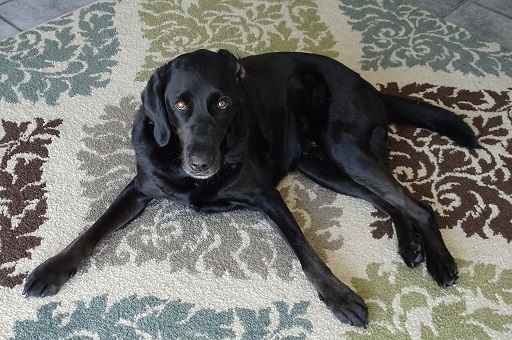 Small pet hairs and other allergens won’t be blowing around as you pass over the carpet. What do we like most about the Cinetic Big Ball? What don’t we like about this model? Where can you get today’s pricing and availability? Click here to visit our favorite online supplier to compare it to other models and read more ratings from other consumers. The SEBO Automatic X4 Pet is a high-end bagged upright that is built specifically for homes with multiple animals. Many people don’t know much about the SEBO brand but they are known in the industry for building very high quality vacuums with “hospital grade” filtration. Remember above how important a highly rated HEPA filter is for removing allergens? The X4 comes with a fully sealed system that traps virtually all of these microscopic organisms as the air passes through. The standard X4 and X5 models come with three basic on-board attachments: crevice tool, dusting brush, and uphostery nozzle. This is pretty standard with a modern upright vacuum but not enough for pulling up pet hair. The X4 Pet model also comes with a turbo handheld tool as well as an extension stretch hose. This turbo tool has spinning brushes which grab even the most stubborn hair particles from fabric, furniture, bedding, etc. Tools like these are a must for homes with animals living in them. One of the coolest features of the SEBO X4 is it can be folded almost completely flat (about 5 1/2 inch profile) while still remaining full powered. You can fit it under a lot of furniture items, and under most beds and tables. This makes it easy to clean underneath these large items without having to move them around. Everyone knows that under a bed is where dust mites hide so this is a great quality for keeping your home free from allergens. It comes with a 12 inch wide power head which is pretty standard. There are also several lights that alert you when the bag needs to be changed or if something is clogging the machine or brush roll. The spinning belt is designed to last as long as the machine. In fact, SEBO provides a lifetime warranty on the belt which is a nice warranty as well. A Boost Button gives you what they call more aggressive brush action, or basically more resistance against the spinning brushes before any automatic height adjustments are made. This works well when you have embedded dirt deep down in the carpet fibers. This Boost option will stir those particles up so the powerful suction can pull them up. These vacuum cleaners are really equipped for deep cleaning your entire household. What do we feel are the best qualities of the X4 Pet? What could use some improvement? Where can you learn more about the SEBO X4 Pet and check prices? By clicking here you will go to our recommended ecommerce store where you can compare different models and get the current price on this high-end pet vacuums. 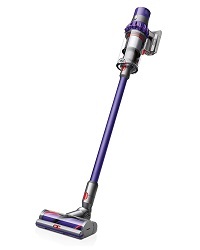 The Dyson V10 Cyclone Animal is our recommended cordless model for homes that have one or more pets. If there was one word that would describe the V10 it would be “BEAST”. This is not your traditional cordless model at all, but rather has as much suction as a lot of full sized uprights that are corded. This power output was accomplished using a couple of different methods. The newly designed 7 cell lithium ion batteries provide all the juice that the V10 needs to put out the power required for entire household cleaning. That’s right, entire household cleaning. When fully charged you can use the Motorhead attachment to deep clean carpets, pulling embedded dust particles and pet hair up from the fibers. It’s amazing how much this machine can pull up from the floors without being plugged into the wall. The motor works in unison with the batteries to make it all happen. The Dyson V10 has a digital motor which pulls upwards of 150 air watts at max power and is rated to remove 25% more dust from carpets than their popular V8 lineup. That is quite impressive because the V8 used to be the Gold Standard for cordless vacuums. You also get a large collection bin to handle all the extra debris it will pull up. A HEPA filter means you will be trapping 99.97% of the smallest allergens like dust mites, dander, and pollen particles from the air before it is pushed back into your home. A very important feature for any pet vacuum to have. Fully sealed also means that none of the small organisms can escape once they are inside the machine. Simply push the button to empty the bin directly into the garbage, no need to touch any of the dust. The mini motorized tool can be used in handheld mode for upholstery, bedding, stairs, or really any small area that has a stubborn mess to clean up. While it can be used in this hand-held mode, the V10 really shines when used as a full sized lightweight upright. James Dyson stated that this model is the reason he has stopped developing corded vacuums…though that remains to be seen. Where can you get current pricing and availability should you want to buy the V10 online? For our recommended online store click here. You can not only check price levels but also read comments from other consumers, and even compare it to similar models. 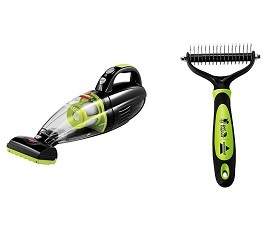 The Bissell Pet Hair Eraser with their Eliminator Bundle is a very affordable hand held vacuum for any animal owner. It is our top recommended model that is strictly a handheld (the V10 above can also operate like this but that is not its’ sole purpose). The Eraser is not designed for large rooms or many carpets, but rather for removing pet hair and other small debris from various surfaces. For this job it is more than adequate, especially when you consider how cheap it really is. This bundle includes a dual sided comb that works just like those used by professional groomers. Use it on your dog or cat (if they let you) to remove mats or help with shedding. Think of it as a powerful brush that really works well but your furry friend will likely need some time to get used to it if you normally use a standard brush. The motorized foot does a decent job on hair that is stuck on upholstery. It also comes with a crevice tool for those tight spaces where things tend to gather. Since the Eraser is so light and small you can really get into just about any space (both high and low) that you need to. Holding it overhead while you vacuum the curtains is effortless. Another bonus of a cordless hand vac like this is you can use it in your car. Get your seats and floor mats looking like new without having to drag a heavy corded machine out into your garage. The Pet Hair Eraser is perfect for this but you may need to empty it a few times if you are doing any serious car floor cleaning with it, especially after a long winter. What do we feel are the biggest Pros of this little Bissell? What are the main Cons when considering it? Where can you check current pricing and read other online reviews? For more information including the cost and shipping options, click here to visit our recommended ecommerce site. 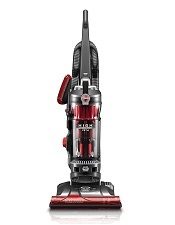 The Hoover Windtunnel 3 High Performance Pet is a great value and our top choice for those on a budget. Hoover is another company known for quality, and they state that this is their best cleaning bagless upright. If you have a home with one or more pets, this is a solid choice for many reasons. The first is their unique Windtunnel technology which creates 3 channels of suction to lift out even the most embedded dirt or pet hair. The air passes through 13 different cyclones on its’ way to the collection bin, which filter it all the way along the path. It comes with 4 onboard tools including crevice and pivoting dusting tools, a telescoping extension wand, and a unique Turbo handheld attachment. This tool has small brushes that spin at a high rate of speed to stir up hair, dust, and other stubborn debris. The Windtunnel 3 also couldn’t make our list without an excellent HEPA filtration system. It is activated with carbon and is fully washable so you won’t have the extra expense of buying replacement filters. This filter is tested to trap and remove 99.97% of microscopic allergens which is important, especially for those who suffer from indoor allergies. Plus the carbon is there to remove smells from the air which every animal lover knows all too well. The power cord is also 40 feet long so you will have little trouble reaching the corners of any room without re-plugging. You can likewise turn the brush roll off to use it as a powered broom on those harder floors like tile, wood, and laminate. If you are looking for a good performing upright at a relatively low price (well under $200), then this Hoover is our recommended choice. Hoover is one of the best known brands and for good reason. It has most of the features of the more expensive cleaners but you likely won’t get as many years out of it as something like a Miele or SEBO. It really depends on your budget, size of home, and how often you find yourself cleaning it. What do we love most about the Windtunnel 3 High Performance Pet? What qualities don’t we like about it? Where is our recommended website to buy a Hoover Windtunnel 3 for your home? Click here to visit our recommended supplier where you can not only check current pricing and shipping options but also read consumer reviews for more information.